A Follow Spot: How Well Does "History of the American Film" Play in Urbana? 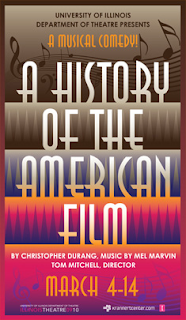 How Well Does "History of the American Film" Play in Urbana? This review ran originally in the Champaign News-Gazette on March 7, 2010. Just in time for the Oscars, the U of I Department of Theatre brings us Christopher Durang’s “A History of the American Film,” a zany, kicky look at how the movies have informed our lives. Tom Mitchell seems to have cast actors who could sing rather than people who resemble the movie archetypes Durang has set down, which may be a problem for those who know their movies well. It’s just a little unsettling when this Loretta (Neala Barron) is closer to an Eve Arden or Alexis Smith than a standard Hollywood ingénue, while Eve (Lena Dansdill) actually looks a bit like Bette Davis, and Bette (Amanda Cabrera) is more the Norma Shearer type. Go figure. Still, there’s good energy throughout the cast, and Barron and her frequent scene partner, Marty Scanlon, who plays Jimmy, sound great on their “Shanty Town” anthem. Jonathan Butler-Duplessis is also in fine voice, and he has fun with a string of ethnic stereotypes, from the black maid and piano player to Indian chief and Japanese butler, all of whom illustrate just how rotten the movies were to minorities. Others of note include Christopher Sheard, who is properly folksy for Hank in the first half, and then pretty darn good when his character takes a “Psycho” turn after intermission; Dansdill, peppy and fun as various wise-cracking blondes reminiscent of Joan Blondell and Ginger Rogers; and Cabrera, who is consistently funny as bad, bad Bette. There is actually a method to all the madness – Durang seems to be pretty clearly commenting on how we all use movies as our Fantasyland when the news is bad, times are tough or we can’t face reality. I’m not sure that point really comes across in this particular production, although things get so grim by the time Hollywood hits the 60s that I may be underestimating the audience and their perceptions. Jack Magaw’s scenic design looks nifty, framing a mostly bare black stage with telescoping proscenium arches and then adding drops and set pieces as needed, while Jessica John’s costumes are striking, moving from black and white to pale green for the Salad girls and bright scarlet for Bette when she rolls into a Marilyn phase. I found D.M. Wood’s aggressive lighting design less successful, mostly because it was often hard to see people’s faces, and Doc Davis’ sound design came off a bit too loud for my taste. Oh, how I envy anyone who has the chance to see this. Don't you wish we could have seen Robert Walden as Jimmy in the original LA production? What fun! I love your joyful, lively writing about all this. I would've loved to Robert Walden on stage as pretty much anything, but Jimmy would've been right up there. Did he or does he sing? Who knew? I am also intrigued by a Terry Quinn who was in the Arena Stage production mentioned at http://www.christopherdurang.com/FullAmerFilm.htm. Do you suppose it's the same Terry Quinn who became Terry O'Quinn and turned into Locke on "Lost"? Or is it the other Terry Quinn, the one who was already a member of Actors Equity so Terry O'Quinn had to take on an O? Kathleen, have you ever acted with Thomas Quinn around here? He's Terry O'Quinn's brother. He might know whether his bro ever played Hank in "History of the American Film"! In that Arena Stage production, Swoosie Kurtz played Bette. I believe she showed up on "Lost" as Locke's mother. So if it's the same Terry Quinn/O'Quinn, it'd be kind of amusing. Clearly you know way more about the history of Terry (O')Quinn than I do! I was all about to say "no way it's the same guy," but now I have to confess I have no idea. But my inclination is to say that this is the other (less famous) Terry Quinn. In that LA production, June Gable (Joey's chain-smoking agent on Friends) was Bette, Teri Ralston (the pot-smoking wife in the original cast of Company) was Eve, Alice Playten was Clara, and Jane Connell was Ma Joad. Durang remembers this as the best-sung of all the productions -- especially the group numbers, which sent him to "musical comedy heaven." You're not going to believe this, but Tom Quinn sat next to me at a show last night. I don't know him (I've just reviewed him a million times) and it didn't seem very nice to open up a conversation with, "You don't know me, but... Was your older brother in a production of 'History of the American Film' in 1978?"